For me, movies are a great way to relax. I can turn off the cares of the real world and the lives depicted on the screen become my world. Afterward, I am in a much better frame of mind to face reality. Accordingly, I have watched quite a few movies over the years. While I am not a film buff, I have developed an interest in movie production and the movie world as an off-shoot of watching films. My expectation was that any tour that TCM lent its name to would have similarly high standards. I was not disappointed as the tour that I went on was quite professional and enjoyable. For the tours, TCM has “partnered” with On Location Tours, which describes itself as the “World's Largest TV & Movie Tour Company.” On Location provides the guide and the bus. From what I could gather, TCM appears to have been active in designing the tour and its content. The passengers gathered for the tour on a street corner west of Rockefeller Center. There was some confusion here as another On Location tour was meeting on the same corner at approximately the same time. However, the guides cheerfully directed people to the appropriate line. For an extra fee, passengers can obtain priority seating. Passengers with priority seating get on the bus first and are guaranteed a seat in the first four rows of the bus. I found this to be worthwhile because even from the fourth row I could see out the front of the bus as well as out the side window. At the various stops, I was able to get off and on with a minimum of waiting. Also, there was no problem hearing the guide or the television. The bus was equipped with video screens, one at the front of the bus and one on either side every five or so rows of seats. As the tour began, Robert Osborne, film historian and TCM's prime time on-screen host, appeared on the televisions to give a short introduction and welcome aboard. Then throughout the tour as the bus came to a location that has been used in a movie, the screens would show a clip from one or more of the movies that were filmed at that location. I found the movie clips a plus. If I had not seen one of the films, it was interesting to see how the location was used in that movie. For those films that I had seen, the clips were a good refresher. In both cases, it was interesting to compare how the location looked in the movie and the way it looks today. The only problem with the film clips is that you have to remember also to look out the window and not become absorbed in the movie playing on the video screen. Our guide was not just an employee of the tour company randomly assigned to do the TCM tour on this day. Instead, he was knowledgeable about classic films and was able to answer questions about the films as well as about New York. He mentioned in the course of the tour that he and some of the other guides had ridden around the City with Robert Osborne when the TCM tour in New York was being devised. In between locations, the guide would talk about movies made in New York and provide bits of movie trivia. For example: The first movie shot in New York was in 1896; “On The Town” (1949) was the first musical filmed on location; Some 200 films have been shot in Central Park; and the Plaza Hotel is the most filmed building in the world. As we approached each location, the guide would set the stage by talking about the various films that had been shot there. The bus drove by most of the 38 film locations featured on the list given to us at the beginning of the tour. However, given New York's often slow moving traffic, there was plenty of time to get a view of each location. We made five stops during the tour. 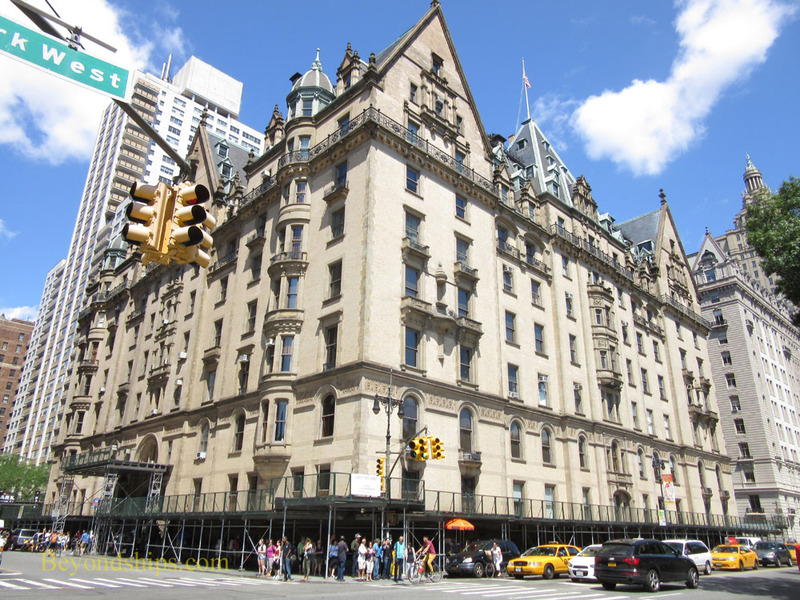 The first was in front of the Dakota, the stately apartment building where “Rosemary's Baby” was filmed but which will be forever known as the place where John Lennon was assassinated. Next, we stopped at Zabars, the Upper West Side market, which appears in “Manhattan” and “You've Got Mail.” This stop provided an opportunity for the passengers to pick up something to eat. The final stop was just a quick photo opportunity. One of the world's most familiar images is that of Marilyn Monroe's dress being blown upwards while she was standing on a New York City subway grating. The image comes from the movie “The Seven Year Itch,” which was actually filmed in a Hollywood studio. However, to promote the film, Ms. Monroe stood on a grating at Lexington Avenue and 52nd Street and repeated the scene for some 2,000 onlookers. Now, that location is in front of a restaurant and it may have bewildered the patrons to see a bus load of tourists arrive, enthusiastically photograph a nondescript subway grating and quickly go off again. During the course of the tour, we viewed numerous landmarks that are world famous for reasons other than that they have appeared in the movies. 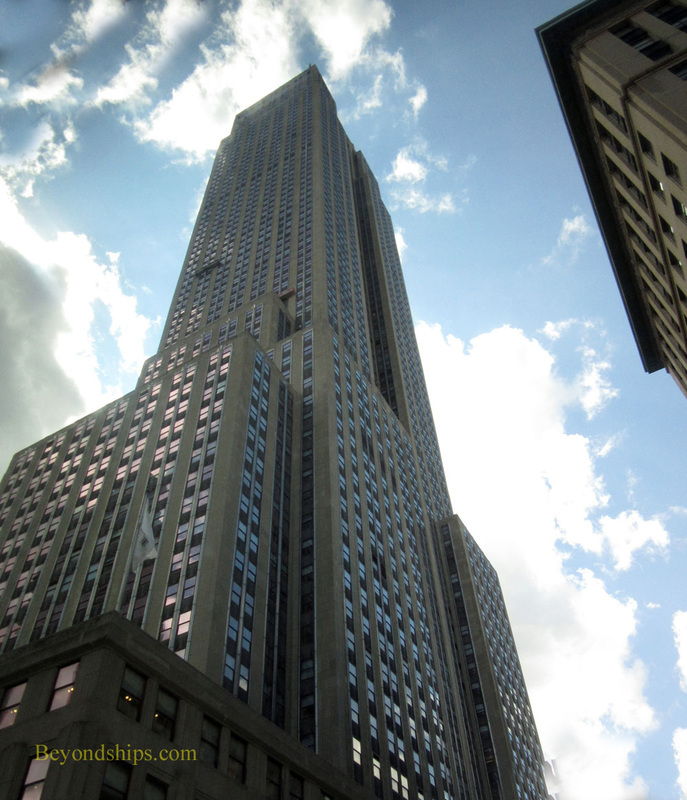 (E.g., The Empire State Building (“King Kong,” “Sleepless in Seattle,” “Love Affair”), Grand Central Terminal (“North by Northwest”, “Superman”), Rockefeller Center (“On The Town”, “Nothing's Sacred”), St. Patrick's Cathedral (“Miracle In The Rain”). Thus, there is something interesting to see on this tour even if you only have a mild interest in movies. Quite a few of the locations are just ordinary places. They were selected to be in the movies because they typify (or typified) some aspect of life in New York. Consequently, visiting them provides an insight into life in the City. 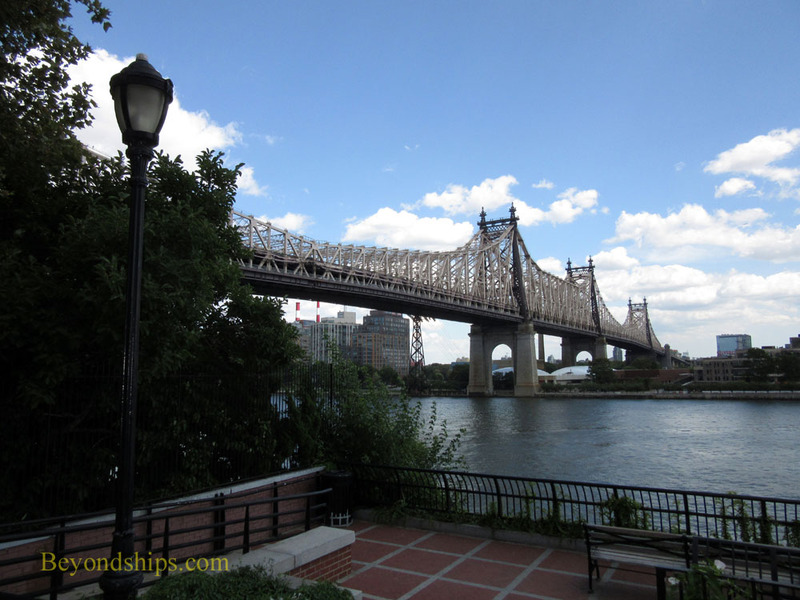 All of the locations were above 33rd Street and below 96th Street. Thus, the tour is essentially limited to Midtown Manhattan. On a three hour tour, there would not be enough time to cover Downtown much less the other Boroughs. Most of the locations pointed out were in films shot after World War II. Although many pre-war films were set in New York, most were made in a Hollywood studio with much less on-location filming than in movies made after the war. The passengers on the tour included several people from the New York metropolitan area as well as people from other parts of the United States and couples from Japan and the United Kingdom. 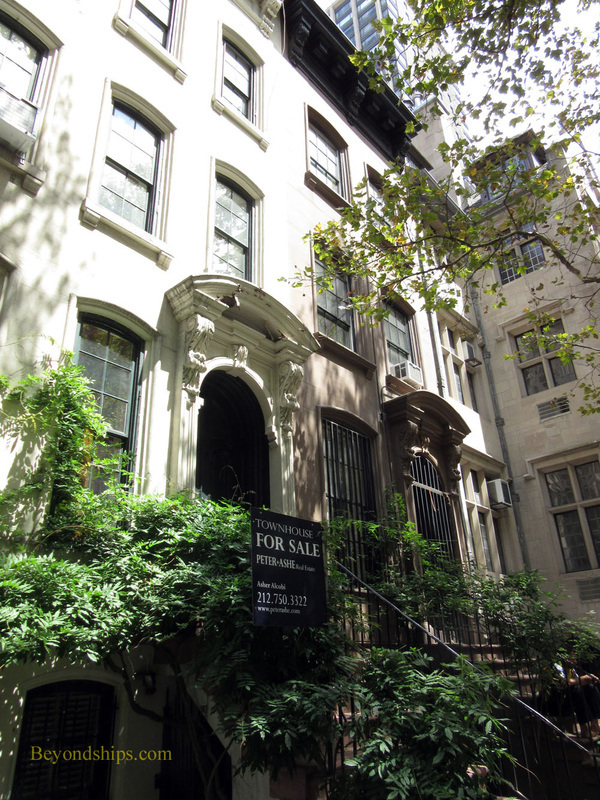 ﻿Above: The first stop on the tour - - The Dakota, a location in "Rosemary's Baby" and the last home of John Lennon.